The new lens features the traditional double-Gauss design with 6 elements in 5 groups. With a minimum focus distance of 1.48’ (0.45m), however, it also features an aspherical element, which is unusual at this level. As you might expect, there are some concessions compared with the high-end models. For autofocus control, this lens eschews the normally quiet and quick linear and direct-drive SSM actuators in favor of a DC motor and unit focusing. Potentially more of a concern is that lens has been designed to focus at the taking aperture, rather than opening up to focus at full aperture like the other models. This means the lens may be slow to focus and may struggle in low light. However, on the plus side, the potential for aperture-dependent focus shift is greatly reduced. The lens also features a diaphragm with just seven aperture blades, and externally, the lens has the typical minimalist design of the majority of FE models. With a 49 mm accessory thread, and measuring 2.70 x 2.24” (68.6 x 59.5mm), the lens is reasonably compact. It is also pretty light, weighing in at 6.56 oz (186g). 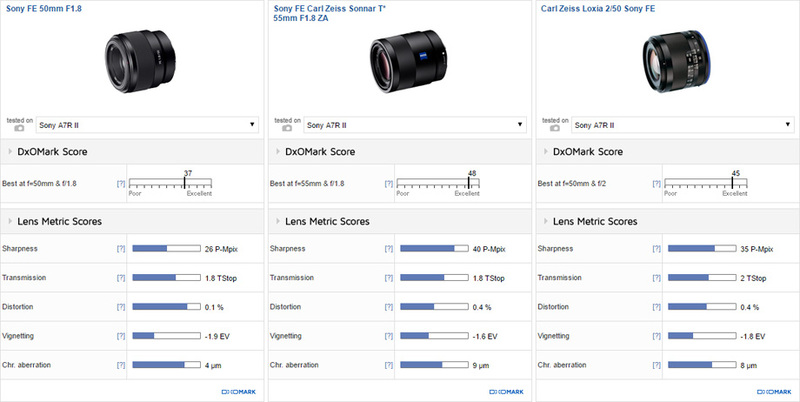 We’ve analyzed the lens using the second-generation, full-frame 42-Mpix Sony A7R II, and are delighted to share the results. Mounted on the full frame 42-Mpix Sony A7R II body the new FE 50mm f1.8 achieved an overall DxOMark lens score of 37 points. Although this a good score it’s not quite at the lofty levels achieved by high-grade models. The optimum aperture is f8, though peak sharpness is achieved at f5.6 in the center of the frame. 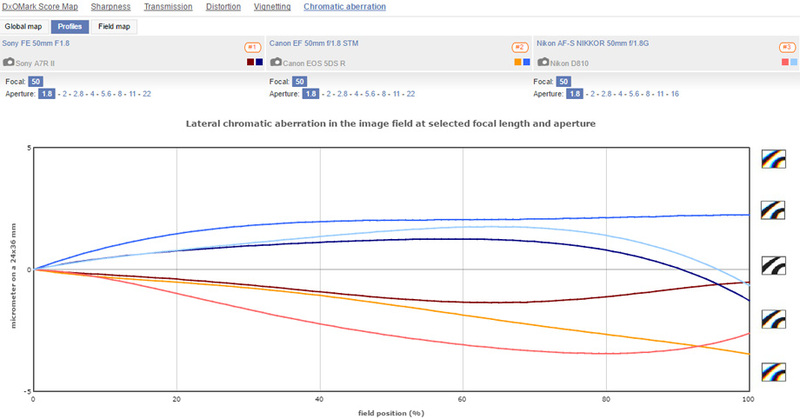 At that aperture edge performance is still some way below the center. Opened up at f1.8 the lens has good central sharpness with some slight astigmatism leading to some softness in the outer field. Stopping down to f2.8 improves central sharpness but at the expense of the edges, where it’s slightly softer than when wide open. However, the edge performance recovers somewhat by f4. While transmission, distortion, and chromatic aberration are all excellent, the lens has quite heavy vignetting wide open though it is greatly reduced by f2.8 and negligible from f4 onwards. The 50mm (or thereabouts) focal length is now well-represented in E-mount, though in terms of price, there’s a stark difference between the Sony and Zeiss models. For around $1000 for the two Zeiss models, you can choose between the manual-focus-only Loxia 2/50 or the autofocus Sonnar T* 55mm. The latter, made by Sony under license, has the slight edge in performance, hence the marginally higher rating, but there’s very little between them in real terms. Both are sharper than the Sony own-brand at every aperture, however, and the Sonnar T* is sharp right to the corners of the frame, even when opened right up to the maximum. Even the Loxia can’t match that, at least not until f/8 (like the Sony own-brand model). The Sony also has more noticeable vignetting than either Zeiss, but it has lower distortion, and somewhat surprisingly, lower chromatic aberration than either, while also matching them in transmission. Against similar models from rivals, the new Sony performs competitively. 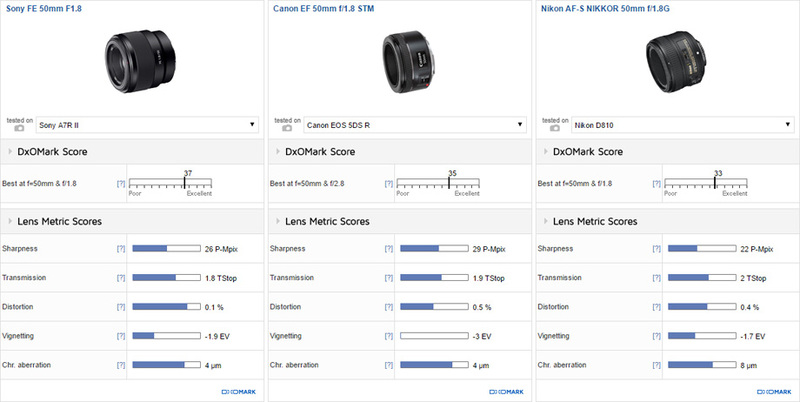 It outshines the AF-S Nikkor by a comfortable margin, and just edges ahead of the new Canon 50mm f1.8 STM model when mounted on the high-resolution 50-Mpix Canon EOS 5DS R. While the Canon has slightly higher peak sharpness, courtesy of that incredible 50-Mpix sensor, and the Sony has a slight lead on the Nikon, all three perform quite similarly. They’re all are sharper in the centers than at the edges up to f/5.6, with the exception perhaps of the Nikon, which is still a little weak in the periphery at f/8. 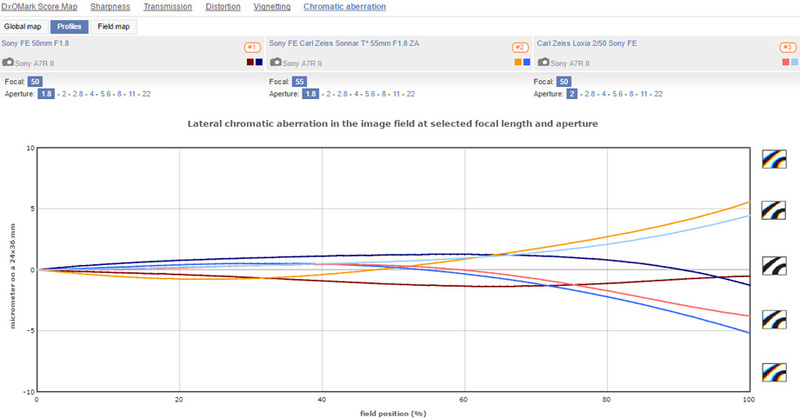 However, the Sony outperforms both in transmission and distortion, and when taking the profiles into account, is more than a match for the Canon in terms of lateral chromatic aberration. Sony has also done well to minimize vignetting. It is practically identical to the Nikon visually; however, the Canon is heavy in the extreme corners, albeit relatively easy to correct in post-production. 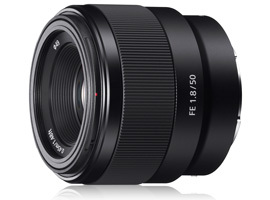 Sony is working hard to fill gaps in the lens lineup, and until now, an affordable 50mm lens had been sorely lacking. While it’s unsurprisingly not in the same class as either the Sony Zeiss 55mm f1.8 or the Zeiss Loxia 50mm f2, its optical performance is comparable to the best of similar offerings from rivals. While there’s always room for improvement—it would have been great to see better uniformity, particularly at wider apertures, for example—the Sony does stand out in several areas. It has excellent control of troublesome lateral chromatic aberration as well as class-leading low levels of distortion. If you’re a stills photographer looking for a reasonably-priced 50mm with decent image quality for your Sony alpha mirrorless camera, then this model isn’t likely to disappoint.